Counter loops are a variation on the hearing loop idea. The same principals apply; a microphone is used to amplify a person speaking through a loop of wire, which in-turn is received directly by a hearing aid. 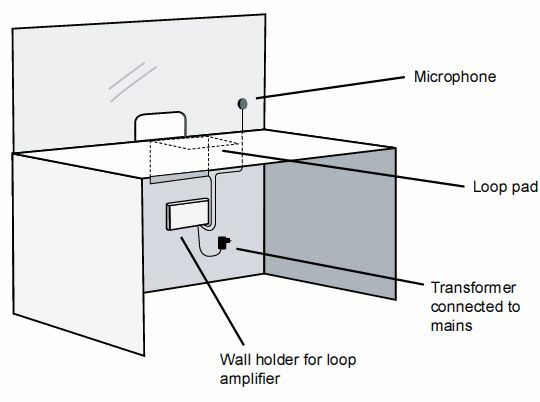 The user simply presses a button on their own device to hear, but rather than looping a room, a small preformed loop is installed at a point-of-contact location and is geared for one-on-one communication. A counter loop is designed for use in close proximity and will accommodate a person in a standing or seated position. Examples of situations where a person with hearing loss would benefit from a counter loop installation would include a ticket window where glass separates two parties and impedes communication, or a service counter in a noisy environment where orders are placed or information is given. international specification for hearing loops so a true benefit can be realized. These little loop systems can amplify any audio source and can be used in rather unique situations. Placing drive-thru orders, using kiosks, taking a taxi, museum exhibits, ATM's, banks, hospitals, airport ticket counters, grocery check-outs, or virtually any cash register ...you get the idea! Counter loops are simple, inexpensive, versatile systems, which can yield ADA audio compliance in public places, and most importantly, can instantly provide equal access for persons with hearing loss. If you have hearing loss and haven't been accommodated, exercise your rights! If you operate a public domain and haven't taken this simple step for your customers... please consider the benefits and get looped!